Gone are the jaw-dropping days when a Harvard scientist captivated audiences on CBS’s 60-Minutes program and on the front pages of The New York Times and The Wall Street Journal, talking about the promise of a bona fide anti-aging pill and how his laboratory had found the holy grail of aging, a survival gene known as Sirtuin1, and its molecular activator, resveratrol. Initial testing showed mega-dose resveratrol prolonged the life of rodents fed a fat-laden diet, but failed to do so for animals on a standard-fat calorie diet. More disconcerting was the widely acclaimed discovery that resveratrol activated the Sirtuin1 survival gene when in fact it was a fluorescent compound used in this assay that was the actual agent that stimulated Sirtuin1, not resveratrol. This only meant that the gene target was off base, not that resveratrol is less promising. But the science was correctly called into question. Subsequent studies provide mixed results for resveratrol as an activator of the Sirtuin1 gene. [Free Radical Medicine & Biology, The controversial links among calorie restriction, SIRT1, and resveratrol, in press 2011] In mammals neither the over-expression of Sirtuin1 protein nor administration of Sirtuin1 activators could extend the lifespan of mice on a standard-calorie diet. In the liver of mice given a calorie restricted diet, which is known to double the lifespan of these animals, Sirtuin1 protein actually decreased compared to mice fed an ad libitum diet, but Sirtuin1 activity did contrarily increase in skeletal muscle and fat cells (adipose tissue) in calorie restricted mice. The bottom line here is that Sirtuin1 is not a consistent measure of aging that completely mimics a limited calorie diet. It only partially mimics calorie restriction. If the Sirtuin1 gene is removed, the biological activity of resveratrol is only partially inhibited. This suggests another gene target for resveratrol apart from Sirtuin1. Scientists are still trying to sort out the main gene pathway that resveratrol activates and they think it involves genes that control the activation of an enzyme called AMPK (adenosine monophosphate-activated protein kinase), a key protein involved in cellular metabolism (see schematic below). Researchers think that the beneficial properties of resveratrol might depend upon AMPK activation. Collectively, the current science suggests that a calorie restricted diet may indirectly activate the Sirtuin1 gene via AMPK. 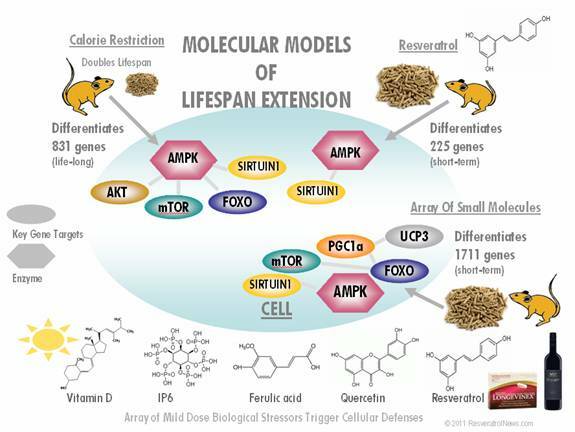 If confirmed, this would be a true breakthrough in the understanding of longevity mechanisms underlying calorie restricted diets and their molecular mimics, like resveratrol. But scientific advisors for some resveratrol supplement companies exist in the past, and malign the science to boost their sales. One company disparagingly claims a competitor’s resveratrol pill didn’t activate the Sirtuin1 gene in a controlled animal study, which is exactly what resveratrol researchers now concede. This res pill company has conducted no scientific studies on whether its own pill activates Sirtuin1, or any other genes for that matter. And Sirtuin1 has been downgraded as a measure of longevity anyway. There are many res pill companies like this, still mistakenly touting Sirtuin1 as a longevity gene, ignorant of the fact it has been dismissed as the “holy grail” of anti-aging. It still stands that an array of low-dose small molecules provided in red wine produce the most profound longevity in humans, as evidenced by the unprecedented longevity among the wine-drinking French. A pill, sans the alcohol, which provides the same wine solids found in 3-to-5 glasses of dark red wine, should serve as the closest mimic of a limited calorie diet. Fermentation of grapes into wine concentrates molecules such as resveratrol, quercetin, ferulic acid and others about 1000-fold. In rodents, life-long calorie restriction activates 831 longevity genes and is a practice that unequivocally prolongs life, doubling the lifespan of lab animals. However, short-term resveratrol supplementation in animals only activates 225 of these 831 longevity genes, whereas an array of small molecules that includes resveratrol along with other molecules found in red wine (Longevinex®) in the aforementioned dose has been shown to activate 1711 genes in the short-term. This suggests red wine pill users are wasting their money as it would require life-long consumption of plain resveratrol to activate the same number of genes as calorie restriction. The exception is Longevinex®, which is the closest mimic of a calorie restricted diet to date, switching 677 of those 831 longevity genes in the same direction. If animal studies can be translated into human application, it is possible to exceed the biological action of plain resveratrol when combined with other small molecules. Resveratrol combined with quercetin and vitamin Dhas been found to exert synergistic rather than just additive benefit. Furthermore, these accompanying molecules also appear to make resveratrol non toxic over a wide dosage range. For new readers on this topic, don’t get confused by all the science. Modern medicine appears reticent to put resveratrol into clinical practice. Its broad biological action threatens to replace many drugs. Resveratrol is certainly a perceived threat to modern pharmacology. Resveratrol, and more so Longevinex®, has already been demonstrated to turn mortal heart attacks into non-mortal events in the animal lab (human studies like this cannot be performed for ethical reasons). Longevinex® is undergoing study to counter aging in the human retina. Furthermore, Longevinex® has been shown to exhibit the most profound effect at inhibiting abnormal new blood vessels in studies conducted at the National Institutes of Health. © 2011 Bill Sardi, ResveratrolNews.com Not for posting on other websites. This is a schematic of the newly proposed molecular mechanism underlying a calorie-restricted diet, the Sirtuin1 gene, and resveratrol. From a mechanical point of view, both calorie restriction and resveratrol can activate the Sirtuin1 gene, but not consistently in all organs and tissues. Resveratrol only partially mimics calorie restriction and activates the Sirtuin1 gene through an indirect mechanism – via an enzyme known as AMPK.